What is GIS? - A computerized spatial or "geographic information system". What is GIS? The best way to answer that might require a bit of background and a history lesson. Mapping has been around for a very long time but the idea to use separate map layers and overlay them was first concieved by Ian McHarg in the 1960's. McHarg's map overlay method gained recognition in a consulting project for an 8 km stretch of the Richmond Parkway on Staten Island, New York, in 1968. By overlaying different geographical layers, he used map transparencies, McHarg was able to determine the optimal route for a proposed freeway that would have the lowest impact on areas of social importance such as parks and other social facilities. Now days the geographical layers are in digital format. 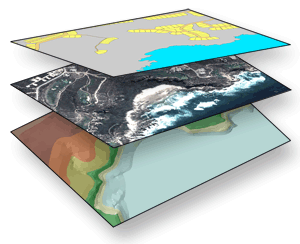 The system to store, organize and manipulate these layers is known as a Geographical Information System (GIS). A Geographical Information System (GIS) is defined as: "An organized collection of computer hardware, software, geographic data, and personnel designed to efficiently capture, store, update, manipulate, analyse and display all forms of geographically referenced information (ESRI, 1995)". So what is GIS? Simply put it is a computerized information system, managed and administered in order to be capable of holding and using spatial data to describe and analyze places on the Earth's surface. They say a picture is worth a thousand words please visit the SMS project gallery to view a few examples of GIS applications.